'Gotham': What Will Jerome Look Like After His Deep Freeze? We Have the Photos! Guest star Cameron Monaghan in the "Mad City: The Gentle Art of Making Enemies" winter finale episode of GOTHAM airing Monday, Jan. 30 on Fox. Guest star Cameron Monaghan in the “Mad City: The Gentle Art of Making Enemies” winter finale episode of GOTHAM airing Monday, Jan. 30 on Fox. Guest star Cameron Monaghan in the 'Mad City: The Gentle Art of Making Enemies' winter finale episode of GOTHAM airing Monday, Jan. 30 on Fox. 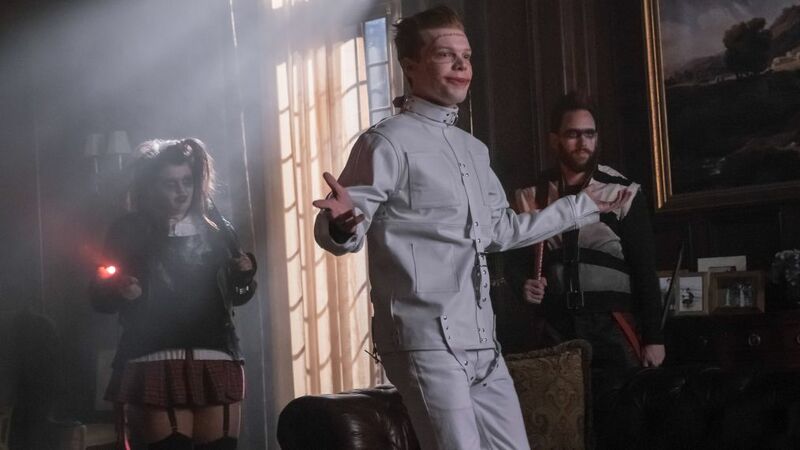 At the end of last week's Gotham, fans got a quick peek at Cameron Monaghan's Jerome Valeska in what appeared to be a deep freeze. Whether he's dead or just on ice remains to be seen, but TV Insider has seen what he looks like after those Joker cultists bring him out of his sleep chamber, and we have the exclusive photos to prove it. "I really can't wait for people to see it," says Shameless' scene-stealing Monaghan of Jerome's long-awaited return to the land of the living—and possible Jokering. "We have a few different looks [for him]...it looks really great. Our make-up special effects designer Mike Maddi did a phenomenal job." Eagle-eyed viewers will note, however, that Jerome didn't have that giant scar last week, so we're guessing that his resurrection includes the kind of demented surgical intervention that would make Hugo Strange proud. Jim Gordon, maybe not so much.